Home→Accessibility→Is Your Blog Against Disablism Accessible to Disabled Bloggers (and Readers)? This entry was posted in Accessibility, Activism, Waspish Wednesday and tagged BADD, Blogging Against Disablism Day, Captcha, horizontal oppression, Internet Accessibility by Sharon Wachsler. Bookmark the permalink. This is an excellent run-down. It frustrates me that web accessibility is often considered a kind of “special provision” when all this stuff makes it easier for everyone. 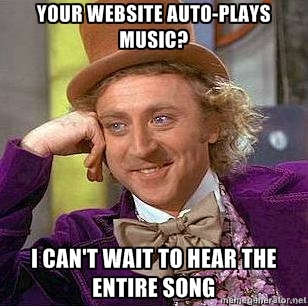 I think most people are, at the very least, annoyed by autoplays – it’s such a bad-mannered device. Transcripts can be extremely useful to many non-disabled readers too, when they’re somewhere they can’t listen to something or want to check or quote exactly what someone said, And CAPTCHAs, in order to remain any barrier to robots, have become longer and more illegible. Meanwhile, none of these steps get in the way of having great-looking and readable web content – as your blog demonstrates. Thanks for participating in BADD! Thanks, Goldie! And thank you for once again taking on the Herculean task of hosting BADD! I’m really looking forward to reading the other posts. I agree — I don’t know anyone who LIKES captcha or autoplays. I don’t technically have any disabilities that prevent me from using them, and yet I often have to try three or four times before I get it right, and occasionally I *never* guess right and give up. (Might be my neurological issues, though; if I ask my partner to read to me what it says, she can always tell me even when I’m baffled.) Oh, and I meant to put this in the post, but it was such a hurried effort I forgot: the audio captchas, IME, are even more difficult to decipher, plus they’re no help if you’re deafblind. 1. Thank you! [basking in the warm fuzzies of appreciation for the site I built with such deep desire for beauty for so many months!] 2. YES! I think actually a lot of the access steps help people toward making a cleaner, lovelier, and more readable blog for ALL. Thanks for the info! I have one question, though. I photograph as a hobby and sometimes (not for BADD) I post series of pictures purely for what I believe to be their artistic value. It is a Livejournal in which I post quite rarely and where, as far as I know, the only regular readers are people I know personally. Many posts a friendlocked anyways. So I wonder whether on the public posts I need to caption these pictures. Excellent question! So glad you asked. If you are just posting for friends and family who you know are sighted, and it’s not a public post, then I think not tagging the pics is fine. I do want to mention, though, that there are people who are blind or low vision who can appreciate photography and also benefit from tags. In fact, I know some blind photographers. It might be that there are aspects of the photos they can appreciate and enjoy for their aesthetics and also want to engage with other aspects that might be limited in their visual field, depending on issues such as color, light/dark, or other details. L-Squared is a great photographer who is blind. Check out her site here: http://l-squared.org/. I hope my response was of use to you. Feel free to follow up if I missed something important. Thanks for your answer. I’ve run into l-squared before, but wasn’t thinking about her… I’ll take a look at your essay to see how you do the alt text, perhaps it will provide inspiration. So, I want to explicitly state that you can download from amara the sub file, and then upload that to youtube. I’ve met too many people who think they HAVE to link to the amara page for the video instead, which isn’t true if you or a friend have access to the account the video is on. Thank you! Yes, I haven’t used Amara yet, but it really seems to make things easier, to be the next generation in captioning, plus since youtube is the monster in the market for videos, it really is essential that they have a workable captioning system now. My brain is too tired to rewrite that section now, but I will try to do it later when I can think AND type. 😉 I have really appreciated your tips and support in the past about alternatives to dotSub. CAPTCHAS are the work of the Devil himself. I come across so many sites giving accessibility advice that still use them!